An unexpected safety car can change a race, especially around the streets of Monaco. While today’s race held more of a procession than we’re used to at any other track on the F1 calendar, the outcome of the Grandest Grand Prix of All was more than one could envision. The Mercedes duo once again locked out the front row with their W06s, while Ferrari scrambled with Red Bull to follow. Hamilton got off to a great start holding pole position into turn 1, Sainte Devote, while Sebastian Vettel had a look up the outside of Nico Rosberg’s Mercedes. The top ten all started on the super-soft Pirelli tire compound which held pace for most for around 30 laps, stretching the tires closer to the grand prix distance of 78 laps than expected. At the first pit stop rotation, the only one expected given the longevity of the softer super-soft compound, the podium-glaring front-running order remained: Lewis Hamilton, Nico Rosberg, Sebastian Vettel. The above order is how the race was expected to end. 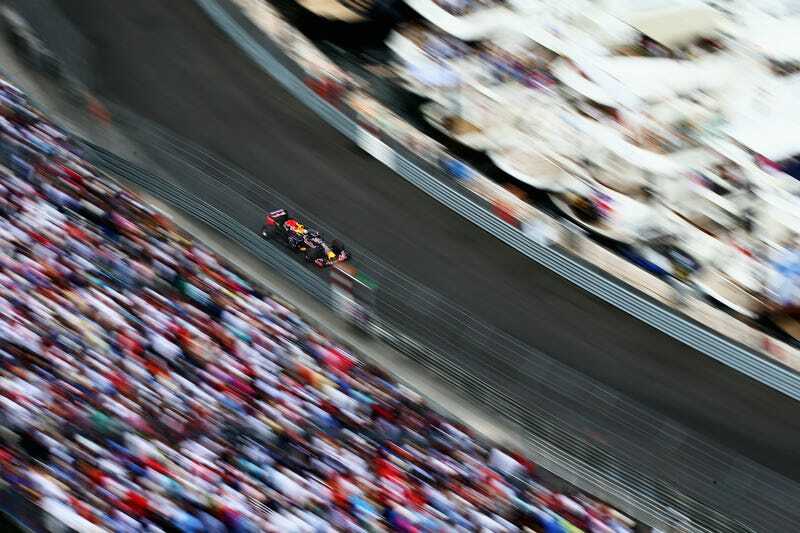 Meanwhile, a lapped Max Verstappen, who earlier had lost his great position behind the lead pack due to a problematic pit stop that left him stationary for 31 seconds, was on a roll sliding past cars on the tail of Sebastian Vettel’s Ferrari. The Monte-Carlo armco had yet to taste his fresh 17-year-old Toro Rosso, and he drove like it to our amusement. Vettel stormed off into the distance in his Ferrari as Max Verstappen and his super-soft tires approached the rear of Romain Grosjean’s JPS-liveried Lotus. Verstappen had a couple of looks early on, and we all expected a terrific pass, perhaps even spectacular. Max closed in on the Lotus gearbox on the pit straight. Grosjean blocked the inside and then quickly darted back to the left side to take the proper line through the corner. Max took the Frenchman at full throttle on the inside of Sainte Devote, but room there was not. Grosjean’s rear approached Verstappen far quicker than any of us, including Max, expected. The slowing Lotus took out the Toro Rosso’s front wheel, and Max flew toward the tire barrier so fast he didn’t even have time to take his hands off the usually manic steering wheel. The virtual safety car was engaged before the real safety car could get out on track to gather up the remaining cars still left racing. At this moment with under 15 laps left, more than half the field pitted for fresh rubber, including the leading Lewis Hamilton. Whatever caught out the Mercedes engineers will be haunting them to their graves, but none will be haunted more by what could, what should have been than Lewis Hamilton himself. Lewis had the race in hand; sure the safety car would close the gap to Nico and Sebastian, but everyone in Formula 1 knows that is blindingly difficult to overtake around these streets. Lewis Hamilton on the fresher super-soft rubber came out behind Nico Rosberg and Sebastian Vettel on approach to the safety car. The green flag was dropped and Lewis could not pass Sebastian Vettel’s Ferrari to save his life following the wake of air of the SF15-T’s aero and the powerful Ferrari power unit. A completely pissed-off Lewis would finish in third by a bewildered and consistent Nico Rosberg there to pounce on anybody’s mistake. What great stories did you see play out at today’s Monaco Grand Prix?